MetroWest is a family-oriented, master planned golf community situated on 1800 acres in southwest Orlando. 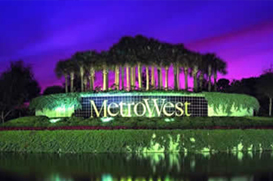 The concept of MetroWest was born over 20 years ago when a group of insightful developers outlined the vision of a true urban village in which people could live comfortably, conduct business, play championship golf, and admire an impeccably maintained landscape, while still having the benefit of the most convenient location in all of Central Florida. What was once only a vision is now a reality, manifested in the vibrant, thriving master-planned community of Metrowest in Orlando Florida. Approximately 1200 acres in Metrowest is either being developed or has been developed already with single family homes, multifamily residential or commercial real estate. The remaining 600 acres are reserved for green space, including golf courses and roadways. There are several new developments including Villa del Lago Condos Metrowest and Veranda Park. Veranda Park is located at the corner of MetroWest Boulevard and Hiawassee Road. Veranda Park is a multi-story mixed-use project, which will feature retail, office and residential space in an upscale town center. The MetroWest master plan assures that its business community will have every advantage – easy access to downtown Orlando, the International Airport, and all major transportation routes. Just as important, Metrowest is exempt from concurrency, allowing for an expeditious permitting process. With its location in Orlando’s thriving southwest corridor, Metrowest is the strategic location for business in Central Florida.